The original version of this report contained errors in Table 7.A8, Table 7.B9, and Table 7.E2. Data on Supplemental Security Income (SSI) awards for 2015 omitted awards to recipients with “unknown” state of residence. That omission also affected several data highlights in the SSI Program Trends portion of the Highlights and Trends section. The correct data now appear in this report. The Supplement is a major resource for data on our nation's social insurance and welfare programs. The majority of the statistical tables present information about programs administered by the Social Security Administration—the Old-Age, Survivors, and Disability Insurance program, known collectively as Social Security, and the Supplemental Security Income program. In addition, data are presented on social insurance programs, including workers' compensation, unemployment insurance, temporary disability insurance, Black Lung benefits, and veterans' benefits. The Supplement also includes program summaries and legislative histories that help users of the data understand these programs. 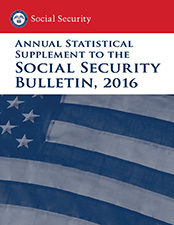 Please note that additional disability tables and statistics can be found in the SSI Annual Statistical Report and the Annual Statistical Report on the Social Security Disability Insurance Program.